If you've noticed the product pages going live at Flipkart for the Sony Xperia U and the Sony Xperia Sola, and have wondered about the exact differences between these two mid-range Android smartphones, you have come to the right place. While the Sony Xperia U and the Sony Xperia Sola have very similar specifications on many fronts, there are a few key differences; and unlike the differences between the high-end Xperia S, the higher mid-range Xperia P and the decidedly mid-range Xperia U, the differences between the Xperia Sola and the Xperia U smartphones do not make it easy for you to make a decision. So we suggest that you take a look at the differences we have identified, and then decide which one would better-suit your requirements. If you are unable to settle on either and are willing to stretch your budget, then you could wait for the release of the Sony Xperia P in India and then decide. Let's get the similarities out of the way. The size of the two smartphones is very similar, with the Xperia U being 4 mm shorter, 5 mm narrower and a hair above 2 mm thicker than the Xperia Sola. 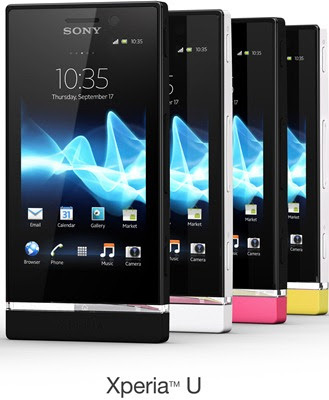 The 110g weight of the Xperia U is also very similar to the 107g weight of the Xperia Sola. Both the Xperia U and the Xperia Sola share the same Ericsson U8500 processor which is dual-core, and runs at 1 Ghz. Both devices also share the same amount of RAM: 512 MB. Radio, 3G, Wi-Fi, Bluetooth and sensors like accelerometer and the proximity sensor are also common between the two phones. Power is provided for both smartphones by a 1320 mAh battery. On the software front, both phones would run Android 2.3 Gingerbread at release, with an update to Android 4 Ice-Cream Sandwich being provided by Sony Mobile later in the year. For photos and videos, both smartphones possess a 5 MP Autofocus rear camera, capable of shooting 720p HD video. The display resolution of both the phones is a Sony Mobile standard: FWVGA, which is 854 x 480. That's where the differences start. The unique feature of the Sony Xperia Sola, is a "floating" display. It allows you to control onscreen elements without actually touching the screen; very similar to the way a mouse pointer is moved across the screen by moving the mouse. To actually 'click' an onscreen element, you could tap the screen with your finger. This display on the Xperia Sola is also larger, at 3.7 inches while the Xperia U makes do with a 3.5 inch screen. Even with a denser and smaller display, the Xperia U measures quite as much as the Xperia Sola due to the newly-introduced transparent notification "block" below the screen. The Xperia Sola also makes do without a front camera, while the Xperia U has a VGA front camera for self-portraits and basic video chatting. Another big differentiator for these two mid-range Android smartphones is the available storage. The Xperia U has a very low capacity of built-in storage, with just 4 GB - and a microSD card slot is absent. The Xperia Sola plays the part of a bigger brother, with 8 GB of internal storage and a microSD card slot for additional expansion upto 32 GB. Which is the right phone for you? Only your exact needs and requirements can help you decide. If the Xperia Sola had a front-facing camera, or if the Xperia U had more storage or at the least, a microSD card slot, we could definitely pick a clearer "winner". Sadly, the decision becomes tougher with the current set of specifications for these two Android smartphones from Sony Mobile. We'd like to leave you with a quick mention of the Sony Xperia Neo L is also slated to launch later this year, although that has very similar specifications to 2011's Xperia Neo V - 1 Ghz single-core processor, 1 GB storage (with microSD card slot, 5 MP rear camera, VGA front camera, 4 inch Mobile Bravia Engine display, and a 1500 mAh battery. Only real change with the Xperia Neo L seems to be that it would launch with Android 4 Ice Cream Sandwich onboard, which is not too much of a boon considering that the Android 4 Ice Cream Sandwich upgrade has been promised already for 2011's Xperia Neo V. Our comments section below would be glad to hear of your thoughts on this mid-range crop of phones from Sony Mobile for India in 2012.
excuse to insert flowers into your gifts. If Raipur is the gift sending address, or you are residing there, then RaipurFloristShop.comis the concern that you were looking for long. Make the trip to www.raipurfloristshop.com to all the exciting stuffs. performer in that. From jungles to the vibrant night life, South Africa gives you the total package in travel, and SouthAfricaToursInc.com provides you the perfect tour package. Join www.southafricatoursinc.com now. a tasty treat, showpieces to showcase your taste for creativity-all awaiting at www.rakhiworldwide.com/rakhigifts/send_rakhi_to_Ludhiana.asp your visit. Just drive in and get your glittering gift ideas. hmm... but u can trasfer ur files to a pen drive connected via mini usb on both the phones, so memory issue is gone for Xperia U,but u cant get a front camera for sola. If i want to watch movies or video songgs i can always do it in a pendrive connected to phone and put the basic songs and games on Xperia U.
your warmth to them. That’s the magical touch you can have for your Rakhi special gifts, and just a click onto www.rakhiworldwide.com/rakhigifts/send_rakhi_to_Gurgaon.asp will let you get them in flash. plan the exact delivery schedule. A click at www.indiafloristnetwork.com/Locations.asp does just that. keeps telling your relations about your feelings for them, deep from your heart. It makes them recall the good times they had with you. Visit www.gifts2spain.com for more details. like cakes, sweets and chocolates. have been missing your presence on their special day. A gift actually brings your inner self before them. Visit www.hampersnationwide.com/UAE/Gift_Hampers_to_UAE.asp for details. have been missing your presence on their special day. A gift actually brings your inner self before them. Visit www.hampersnationwide.com/France/Gift_Hampers_to_France.asp for details. have been missing your presence on their special day. A gift actually brings your inner self before them. Visit www.hampersnationwide.com/Malaysia/Gift_Hampers_to_Malaysia.asp for details. have been missing your presence on their special day. A gift actually brings your inner self before them. Visit www.hampersnationwide.com/Spain/Gift_Hampers_to_Spain.asp for details. have been missing your presence on their special day. A gift actually brings your inner self before them. Visit www.hampersnationwide.com/Hungary/Gift_Hampers_to_Hungary.asp for details. face. Visit www.rightflorist.com/Brazil_Florist/Gifts_Flowers_Brazil.asp for more info. face. Visit www.rightflorist.com/Southafrica_Florist/Gifts_Flowers_southafrica.asp for more info. face. Visit www.rightflorist.com/Tha land_Florist/Gifts_Flowers_thailand.asp for more info. have been missing your presence on their special day. A gift actually brings your inner self before them. Visit www.hampersnationwide.com/Ireland/Gift_Hampers_to_Ireland.asp for details. have been missing your presence on their special day. A gift actually brings your inner self before them. Visit www.hampersnationwide.com/China/Gift_Hampers_to_China.asp for details. have been missing your presence on their special day. A gift actually brings your inner self before them. Visit www.hampersnationwide.com/Denmark/Gift_Hampers_to_Denmark.asp for details. face. Visit www.rightflorist.com/UAE_Florist/Gifts_Flowers_UAE.asp for more info. face. Visit www.rightflorist.com/Ukraine_Florist/Gifts_Flowers_Ukraine.asp for more info. If you are unable to settle on either and are willing to stretch your budget, then you could wait for the release of the Sony Xperia P in India and then decide.